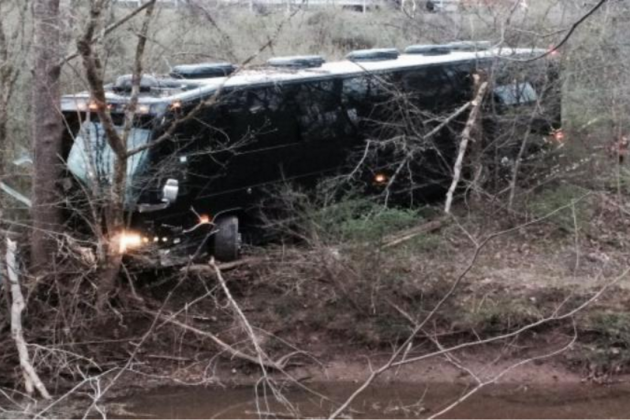 A tour bus carrying members of Gregg Allman’s road crew crashed in Jackson County, West Virginia early Wednesday morning en route to a concert that evening in Charleston. WSAZ Huntington reports ten members of Allman's sound crew were on the bus when the driver experienced a choking incident behind the wheel, causing the vehicle to cross the southbound lanes on Interstate 77 into the northbound lanes, went through a guardrail and over an embankment around 5:00 AM. Three of the crew were sent to hospital, treated for minor injuries and released later the same day. Gregg Allman was not on the bus at the time of the accident. The rocker thanked the members of his crew during Wednesday night’s show at the Clay Center in Charleston. "I want to thank my crew after being through a nightmare," Allman said after he and his musicians took the stage. Allman is currently playing dates across the US and, this week, announced a series of fall co-headlining dates with ZZ Top.